This Steiff Minnie will be made for 2013. Head jointed, arms and legs wired, stuffed with synthetic filling. "Disney images shown are not final, prototypes have been photographed." 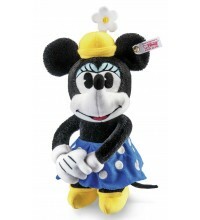 This Mickey Mouse is made in cooperation with Walt Disney Company. Timothy is 18 cm. / 7” tall and limited to 2.000 pieces world wide. He is Dumbo`s biggest fan. 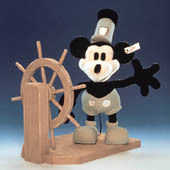 This Mickey Mouse is one of Disney's most famous pieces. He is made to celebrate Fantasia 2000. He is 25 cm / 10” tall. He is limited to the year 2000. This flamingo is one of the Fantasia 2000 pieces. He is 35 cm. / 14 inches tall and comes with a stand. This is one of the figures of Fantasia 2000. She is 37 cm. / 15 inches tall. The stand is included. She is limited to 2000 pieces world-wide. A real must for a Disney fan. This is also a Fantasia 2000 figure. She is a world-wide limited edition of 2000 pieces. This alligator is a high quality piece. He is 31 cm. / 13 inches tall. It is also a limited edition to celebrate Disney's Fantasia 2000 . He is limited to 2000 pieces world-wide. When you are a Disney Collector this piece is a must. She is 34 cm. / 14 inches tall and made of mohair. She is limited to 3.000 pieces each world wide. Note: Donald Duck is sold out!